The view from the double swinging aluminum doors of the Chase Bank in Historic Buckeye is quite spectacular. Everything inside is a typical Chase interior except when you glance out the front doors which looks onto the rustic aged super graphics painted on the brick of the historic San Linda two story building. The rustic brick cropped image beyond the glass doors is such a stark contrast to the sleek commercial interior. You know you are in the heart of Historic Buckeye. 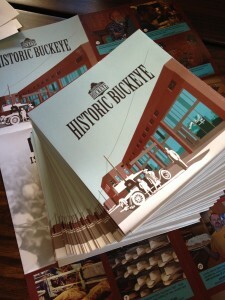 I was dropping off a stack of the brand new maps of Historic Buckeye. I had some banking to do and after I was done I shared the map with teller Blanca Villareal. She became very friendly as she explained, “I have lived in Buckeye since I was 10 years old.” She was excited that something had been done like this for Buckeye. The Buckeye she remembers was a robust down town full of activity and buzz. The flier made her feel hopeful for the future. She thought the maps would be a great item to give to a new client opening up an account. Blanca has noticed that more people are buying homes and opening new accounts in Buckeye. Derek Stephens, a third generation Buckeye local and personal banker for this particular Chase branch was happy to see the fliers. He opened up the flier and his whole face lit up, “This is awesome! I love the photo of Hobo Joe!”. This map was a group effort designed and printed by the Buckeye Main Street Coalition. I am very proud indeed to be a member of this group. Our group combines the unique skills and vantage points of both public and private sectors to revitalize down town historic Buckeye commercial district. Through a gradual process that begins with small steps, sustainable improvements are being achieved. Lara Serbin is the founder of Serbin Studio. She has had continuous involvement in the design and construction industry since 1995, and worked in all phases of project management, programming, design, and construction administration. Lara has particular interest in conceptual design with respect to cost efficiency and energy conservation. Copyright © 2013 Serbin Studio. All Rights Reserved.